In my opinion, the most critical of the principles of design is Balance. It is also one of the most subjective, making it tricky for many people to master in their own homes. Balance is when the various items or elements in a room carry equal visual weight. Harmony is closely related to Balance – it is a state whereby all of the “parts” of a room relate to one another, and combine to form a pleasing and complete whole. With both Balance and Harmony, we know it when we see it – but how can we consciously create it without ripping down our houses and starting from scratch (which is perhaps even more daunting!)? I thought I would share some snapshots from a client project in progress that illustrate this well. Picture this: you move into a new house. The prior owner has made some updates, but the materials they picked aren’t your favorite. And the cost of replacing them is a bit daunting – especially when you’re not sure what else to do. This happens all the time. Maybe it’s even happened to you. If you’re committed to the bones of your house – whatever the reason – you need to embrace them and work with them, rather than fighting against them. This is the granite tile in my client’s powder room. 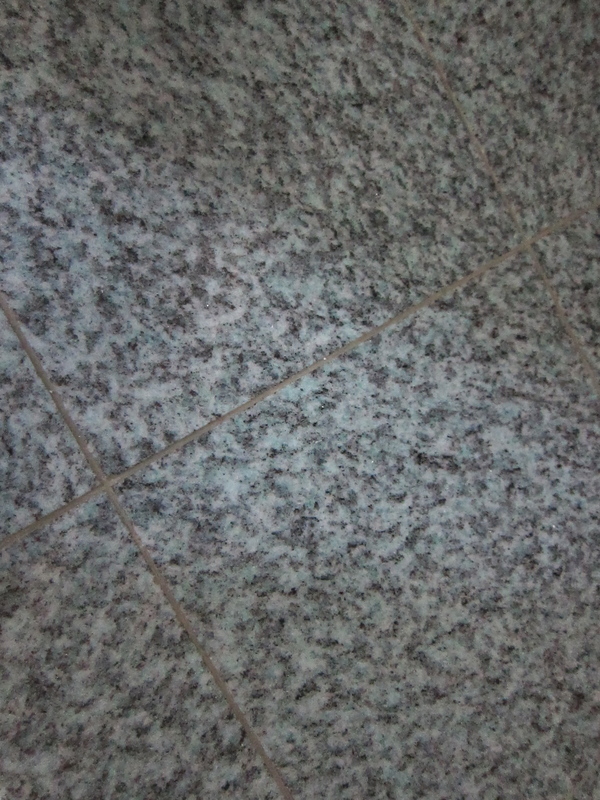 It’s a bit busy, like most granite, and has lots of black, blue, but the really “bossy” component of this stone is seafoamy blue-green. In color design this is called the “mass tone” – or, the main color you see (forgetting about undertones, etc.). The photos don’t do it justice; it’s pretty colorful. And this is what the powder room looked like last week. 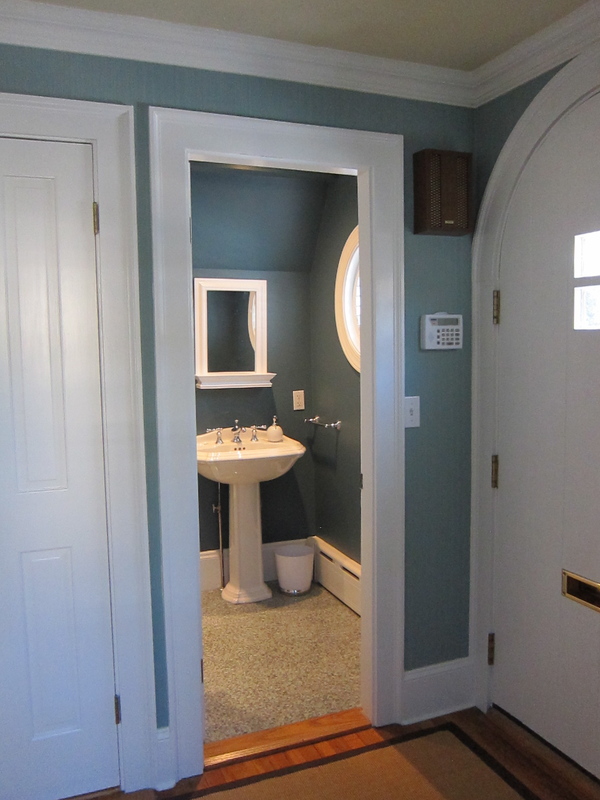 The walls are painted in a cool gray which has a blue undertone – lovely in itself, but it unfortunately has no relationship to the tile on the floor. My clients never really liked the room (or the tile), but weren’t sure what to do. They weren’t enthusiastic about the prospect of ripping out the tile, especially with other projects that are a higher priority. I knew that changing just one thing in this room would change the way they felt about this space. You probably guessed, that one thing we did was PAINT! We EMBRACED the tile, and balanced it significantly by putting a darker, more saturated color on the walls. 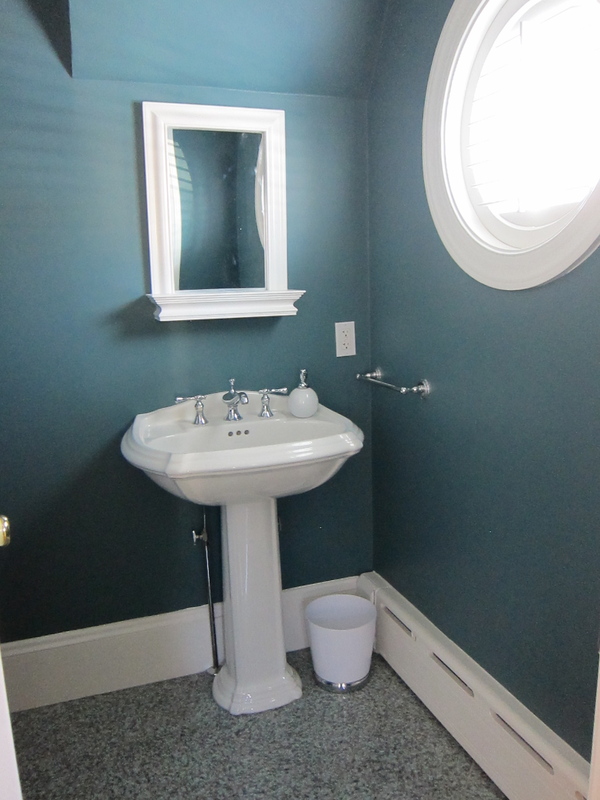 But not just any bold color – it’s a color with the same undertone as the granite on the floor, creating a sense of harmony in this powder room. Now the tile doesn’t stick out like a sore thumb, it looks like it was supposed to be there all along. Incidentally, we also embraced a bit of the nautical flavor of this room (created by the round porthole-like shuttered window) by choosing this color, and will likely push that vibe a bit further as we complete the finishing touches. 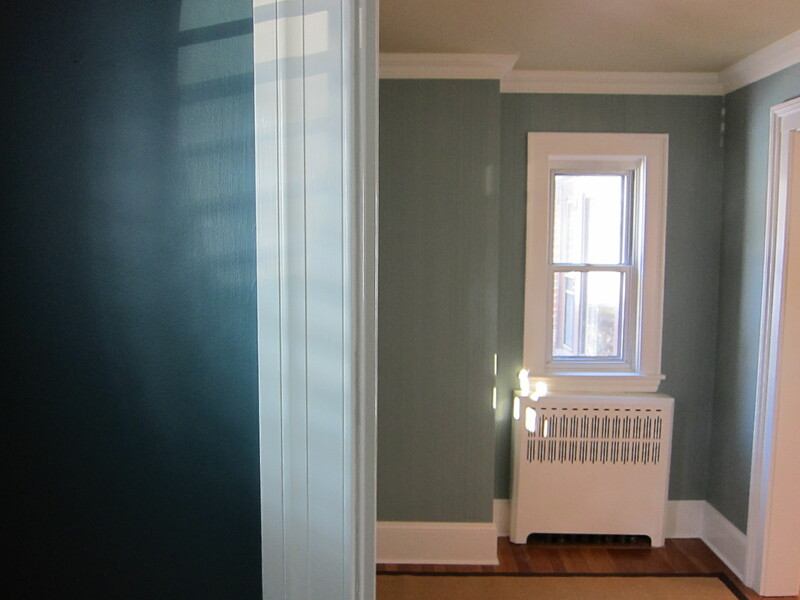 The paint color is Benjamin Moore Fair Isle Blue, from the Color Stories collection. Balance and Harmony do not live in just one room in our homes, though – we have to always remember how spaces flow into one another and relate to each other. Although we can take some creative license with powder rooms and the like, I favored the idea of creating a strong connection between this bath and the adjacent room – the foyer. The foyer is also a work in progress, but has just been wallpapered in a mid-tone blue strie paper that relates well to the deeper blue color in the powder room. And the blue of the foyer will become an accent color in the adjacent living room. But I’ve already said too much about the foyer – the big reveal is yet to come! Bottom line: If you want or just need to live with certain existing conditions in your home, be they tile, walls, cabinetry, hardwood floors, appliances, etc., go with them, not against them. Fight the urge to pick a pretty color, or your favorite color, and you’ll be much happier with the results, even if it’s not something you would have chosen, had you the luxury of a blank slate from which to start. Sometimes, this gets complicated, even paralyzing. You naturally want to avoid costly mistakes. If you need advice on color in your home, or have a decorating project to tackle, I would love to help – please visit my business website and contact me! Next articleBathroomWhat Looks Good With Carrara Marble? Thanks, Donna! I know, right? Feel free to snag the photo for your Color Stories page (though it’s not a 100% finished space). That would be great if I can do that! It’s extremely rare that I get any AFTER pictures let alone a Color Stories shot. I’ll take it! Thank you! Here’s the link to my Color Stories page with your Fair Blue Isle power room. Thanks again Kelly! Exactly – and thank you for using the word “balance” too! That was the idea and I’m glad that’s apparent. wow what a difference. Love the color with tile. Great job! Thanks, Linda! I am really happy with how it turned out, and the client loves it, which is really the most important thing. It’s so great when you can spend a little to save a lot! Totally agree about using paint to “make it work”. You chose a beautiful color. Thanks for linking up! Thank you Emily for stopping by, and for your comment! I’m really enjoying seeing all of the projects on the link up – it’s a great variety, and very inspiring. Thanks for hosting it! Your means of explaining everything in this paragraph is really nice, every one can simply be aware of it, Thanks a lot. Thanks for your marvelous posting! I certainly enjoyed reading it, you will be a great author.I will ensure that I bookmark your blog and may come back very soon. I wouldn’t mind publishing a post or elaborating on a few of the subjects you write in relation to here. Again, awesome site! My partner and I stumbled over here coming from a different page and thought I should check things out. I like what I see so now i am following you. Look forward to going over your web page yet again. Everyone loves what you guys are usually up too. Such clever work and coverage! Keep up the very good works guys I’ve added you guys to blogroll. Hi! I’ve been reading your weblog for a while now and finally got the bravery to go ahead and give you a shout out from Kingwood Tx! Just wanted to tell you keep up the great work! I am really enjoying the theme/design of your web site. Do you ever run into any browser compatibility issues? A few of my blog readers have complained about my site not operating correctly in Explorer but looks great in Chrome. Do you have any tips to help fix this problem? I too am an aspiring blog blogger but I’m still new to everything. Do you have any suggestions for novice blog writers? I’d really appreciate it. simple, yet effective. A lot of times it’s tough to get that “perfect balance” between usability and visual appeal. I must say that you’ve done a great job with this. I’d really like to be a part of group where I can get feed-back from other experienced individuals that share the same interest. If you have any recommendations, please let me know. Thank you! Hi! This is my first comment here so I just wanted to give a quick shout out and tell you I truly enjoy reading your articles. Can you suggest any other blogs/websites/forums that deal with the same topics? Thanks! Do you have a spam problem on this blog; I also am a blogger, and I was wanting to know your situation; we have created some nice methods and we are looking to trade methods with other folks, be sure to shoot me an email if interested. would be a good asset. If you ever want to take some of the load off, I’d absolutely love to write some articles for your blog in exchange for a link back to mine. Please blast me an e-mail if interested. Regards! Have you ever thought about adding a little bit more than just your articles? I mean, what you say is valuable and everything. Nevertheless think about if you added some great photos or video clips to give your posts more, “pop”! Your content is excellent but with images and clips, this blog could undeniably be one of the very best in its niche. Wonderful blog! Have you ever considered creating an ebook or guest authoring on other websites? I have a blog centered on the same topics you discuss and would love to have you share some stories/information. I know my readers would appreciate your work. If you are even remotely interested, feel free to shoot me an e mail. Hey there! Someone in my Facebook group shared this website with us so I came to check it out. I’m definitely loving the information. I’m bookmarking and will be tweeting this to my followers! Exceptional blog and superb design. start my own website soon but I’m a little lost on everything. Would you advise starting with a free platform like WordPress or go for a paid option? There are so many choices out there that I’m totally overwhelmed ..
send you an email. I’ve got some creative ideas for your blog you might be interested in hearing. Either way, great website and I look forward to seeing it grow over time. to this superb blog! I guess for now i’ll settle for book-marking and adding your RSS feed to my Google account. I look forward to brand new updates and will share this website with my Facebook group. Chat soon! Hiya! I know this is kinda off topic but I’d figured I’d ask. Would you be interested in exchanging links or maybe guest authoring a blog article or vice-versa? My blog covers a lot of the same topics as yours and I believe we could greatly benefit from each other. If you happen to be interested feel free to shoot me an email. I look forward to hearing from you! Wonderful blog by the way! 4. I’m trying to find a theme or plugin that might be able to correct this issue. If you have any recommendations, please share. Cheers! Hey there this is kinda of off topic but I was wondering if blogs use WYSIWYG editors or if you have to manually code with HTML. I’m starting a blog soon but have no coding knowledge so I wanted to get advice from someone with experience. lucky this home had beautiful substantial trim. the greens really look wonderful, the CSP color is wonderful, small bathrooms need this intimacy. Thanks for your comment, Lynne! I agree – love to go big and bold on the walls in a powder room.